This weekend, Glen Mills, from Derbyshire, was appointed as iFLY UK’s first Inclusivity Ambassador, championing indoor skydiving for those of all ages and all abilities. 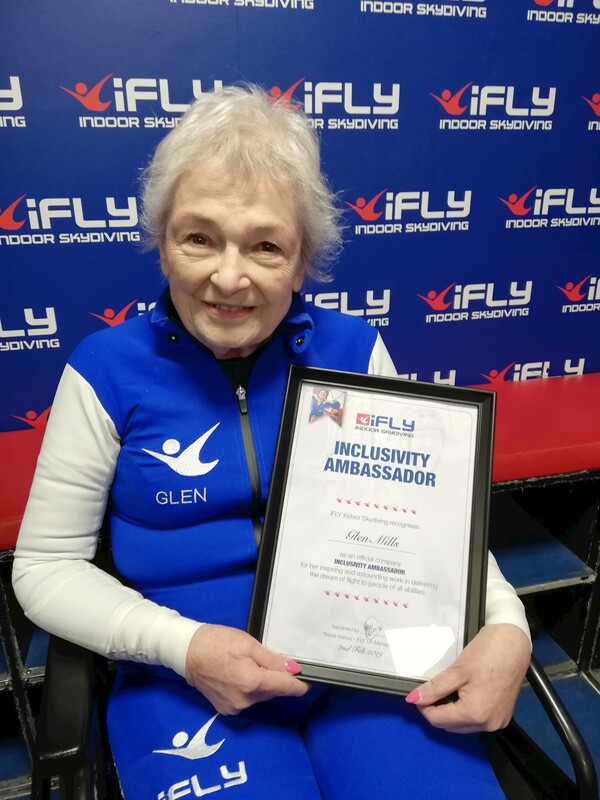 Glen, who celebrated her 85th birthday, along with husband Brian, were presented with their Inclusivity Ambassador certificate, at a special event at iFLY Manchester. Glen, who was diagnosed with multiple sclerosis aged 35 and is a wheelchair user, discovered indoor skydiving three years ago when one of her daughters gave her a voucher to visit iFLY Manchester. Since then Glen has flown with iFLY once a week, the weightlessness offering her pain relief for her multiple sclerosis as well as enjoying the adrenaline rush of flying in winds of up to 110mph. “I’m thrilled to have been selected as an Inclusivity Ambassador for iFLY. Since trying indoor skydiving for the first time three years ago – I’ve been hooked! Not only does it ease muscle tension caused by MS, but the sensation of flying has given me a whole new lease of life. Glen is just one example of the inspiring people who have flown at iFLY. iFLY’s instructors are trained in supporting all kinds of disabilities – both physical and mental – to ensure the possibility of flight is made a reality for as many people as possible. iFLY instructors across the three UK centres in Milton Keynes, Manchester and Basingstoke, have supported flights for blind servicemen, paraplegics, those with cerebral palsy and children with autism. More about Glen’s story can be found here. Brian was born in 1943 in a small village in Gloucestershire where he remained until moving Glossop in Derbyshire in 2008. He was an agricultural engineer by trade and, at the age of 22 he decided to become self-employed, supplying and installing television aerials. In 1985 television via satellite became available so he moved into this area. Clients included the BBC, British Council, NAAFI and Universities throughout the British Isles and Europe, including in Moscow, Poland, Yugoslavia, Czechoslovakia, Hungary, Romania and Gibraltar. Glenys (Glen) was born in 1934, also in a village in Gloucestershire. On leaving school she joined a firm of solicitors where she remained until moving to Portsmouth in 1952. 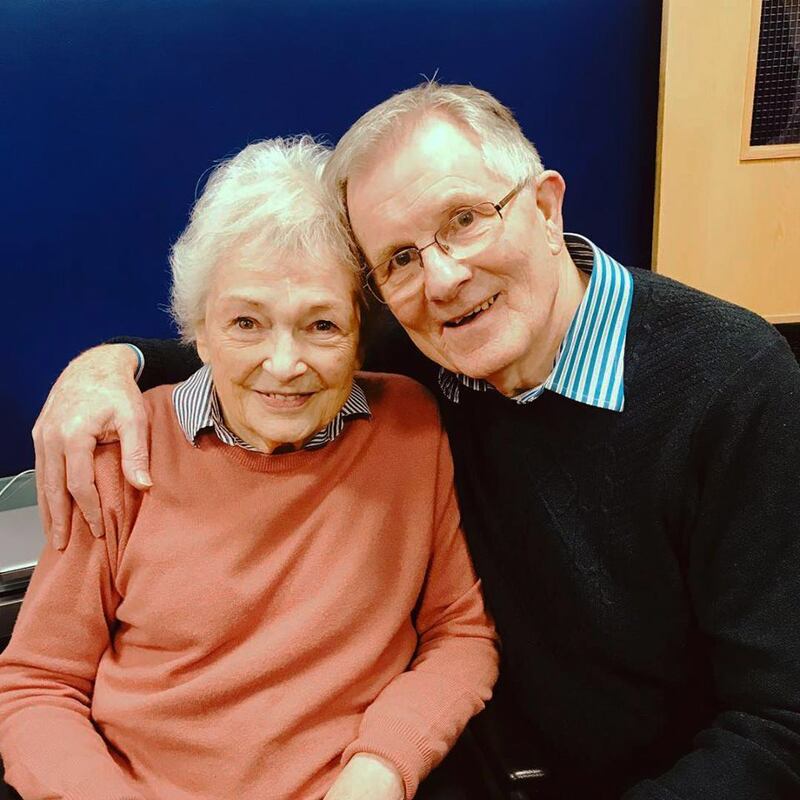 At the age of 35 she began to have trouble controlling her limbs and, ten years later, was finally diagnosed with MS. She carried on doing the administration for Brian's business until the MS forced her to retire at the age of 60. Since then they have travelled widely and during their travels have taken part in hang gliding, ziplining and abseiling, as well as indoor skydiving. Glen has enjoyed all these sports from her wheelchair. At the age of 82, Glen's two daughters bought her an iFLY indoor skydiving gift voucher for Christmas. This turned out to be such an enormous success that she now flies once a week and intends to carry on for as long as possible. One of her greatest joys has been the fact that her two daughters and six grandchildren are all happy to join in the fun on special occasions.